Books that give young readers insight into what it's like to feel, think, or be different from one's peers are important to have in our classrooms. There are students who face challenges with fitting in because they are considered different so they can relate to these sorts of books. These books can also help students understand others' differences and develop empathy toward others. 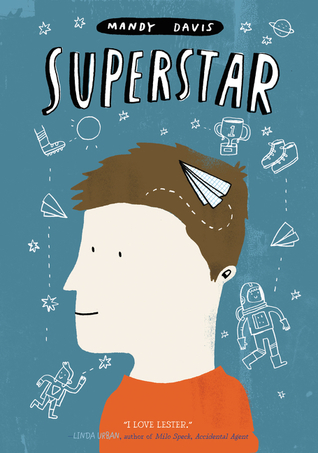 Superstar by Mandy Davis, told from the perspective of a boy with Autism Spectrum Disorder, is such a book. Lester has never gone to school before because his mother home-schooled him. When his mother gets a job and sends him to fifth grade, he has difficulty adjusting to his new environment and following the rules. Making friends isn't easy either because many of his classmates think his behavior is odd and one student is especially mean. The one friend he does make soon starts to reject him. Although Lester is faced with these challenges at school, he is excited about the science fair. Lester loves science, much like his dad who was an astronaut and died in a shuttle accident. Navigating school life isn't easy for Lester because of his disorder, but he works through his challenges and finds ways to shine like a super star. Lester is a true-to-life and appealing character. He is unique, smart, and capable of solving his problems even in the face of a disorder, that as his mom explains to him makes his brain work a little differently. He can provide readers with a model of how to manage school and friends when it seems difficult to fit in. Lester can also give readers a glimpse of what it's like to be different. Superstar is a wonderful story and an important one to share with middle grade readers to help them understand that we are all different.